Years of climbing high into different buliding scenarios has given us the ability to provide cleaning services in areas where most people can not reach. Our high cleaning services are often in demand for our commercial cleaning clients. While expensive systems can be put in place to access almost any area, our professional services can often reach these areas without renting expensive equipment. Our technicians are experienced in climbing up high with brush and cleaner in order to perform high dusting services. We can get the dust off of beams with our high reach cleaning services. 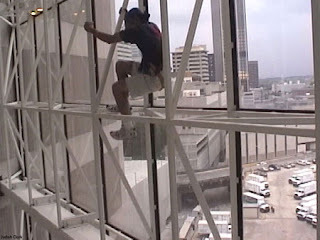 Our cleaners often use vaccums equiped with HEPA filters while high climbing in order to high dust the interior structures within atriums and other architectural areas. High climbing and high dusting is just another cleaning service that you would expect a professional cleaning company to provide. Our high reach cleaning services often prevail where other high reach cleaning systems fall short. Call us today to see how our high services portfolio can save you money while dusting the cobwebbs off of our commercial property. This high climbing and high dust removal service is just one of the many ways that we go the extra mile to make sure that our commercial cleaning services get the entire job done. Often, we are called by electricians and sign installation companies to provide high climbing services to reach areas where other technicians won't go. Our high climbing services have been fine tuned over the years to ensure safety. Additionally, our high climbing company will provide you with reliable service. Find out more about our high climbing service consulting.